Optics and photonics industry depends on rare-earth elements. China lifted its export restrictions on the 17 rare-earth elements (REE) in January. Now, five years after China’s 2010 restrictive action caused a rapid rise in REE prices, followed by a rapid decline, the high-tech industry that depends on these raw materials for such things as cellphone batteries, LCDs, catalytic converters, and permanent magnets is going through another stage of innovation and adaptation. The industry is again in a state of flux as electronics manufacturers search for new mining and refining technologies, economical recycling options, and substitute materials that have the same or similar magnetic, luminescent, and electrochemical properties. Rare-earth elements are metals (see list below) used primarily by manufacturers in China, Japan, and the United States. They are crucial ingredients for advanced military equipment such as night-vision goggles; offshore wind turbines, hybrid cars, and other green machines; as well as cigarette lighters, X-ray screens, and some industrial lasers. Lanthanum-containing glass is used in nearly every optical design for consumer and high-end optical systems, and the preferred polishing compound for precision optics uses cerium oxide. REEs are so important because they help make products perform with reduced weight, emissions, and energy consumption and/or provide greater durability, efficiency, speed, and thermal stability. In 2010, China had a near monopoly in the global rare-earth industry, supplying 97% of the world’s rare-earth elements. China could mine and process rare earths at low cost with its cheap land, energy, and labor. In addition, the country’s limited environmental protection requirements undercut other mining and refining operations around the world. Then the unthinkable happened. The Chinese Ministry of Commerce announced its decision to reduce China’s global rare-earth exports by 40%. Prices quickly quadrupled. And then the world adjusted. As they say, the best cure for high prices is high prices. Free markets have generally managed to adapt when faced with shortages of critical materials. Though China still dominates the REE mining industry, other countries including India, Malaysia, Russia, Vietnam, USA, Australia, and Brazil also mine rare-earth elements. After 2010, the need for a rare-earth supply chain independent of China forced the USA, Canada, Malaysia, and even Greenland to look at their REE assets. Japan vowed to reduce its dependence on Chinese REEs by 60% within four years. The success at adapting resulted in a decline in REE prices. However, with a 47% price drop in 2014 alone, these rest-of-world mining operations have taken a huge hit. The US company Molycorp, for instance, reopened REE mining and refining operations in California in 2010 with great excitement. As of the fourth quarter 2014, though, the company has been shipping product at revenue of $29/kg but at a cost of $33/kg. The steep REE price decline hurts mining in China as well. Today, the environmental crackdown on REE mining and refining operations by the Chinese government has increased that country’s production costs. Once prices stabilize, only time will tell how the world material-supply balance for REE will sort itself out. New sources are being considered, ranging from mining the REE-rich seabeds off the coast of Japan to mining rare-earth elements on the moon. Because of the dispersed nature of these elements in the environment, the number of steps needed to refine them is enormous and complex. To make the REE refining process more sustainable and cost effective, researchers have looked into alternatives. The most intriguing is the use of fish sperm or milt, a waste product in Japan. The challenge, however, is in the quantities of milt necessary for processing tons of material. Another technology in development is electrophoresis. This is a well-known technology in the biology field. It separates biological materials based on size and charge. Both these processes still require the use of large volumes of acid to dissolve the REE in water to start the extraction process, an environmental challenge. A recent patent awarded to a magnet-producing company Zylon (Japan) claims an alternative to acid leaching. Ammonium sulfate or cake alum can be used to solubilize the REE. Typical uses for ammonium sulfate are as a treatment for drinking and wastewater, a bulk nitrogen fertilizer, and a pH-control additive for soil conditioning. It is available at scales that can support refining and recycling operations. Samsung and Hitachi in Japan have taken up the challenge to develop new low-REE magnet technologies by redesigning their motors to favor electromagnets and not rely exclusively on permanent (REE-containing) magnets. Tesla, the electric car manufacturer, has also moved toward electromagnets to reduce dependence on REE permanent magnet technology. Recycling REE is difficult because there are insufficient quantities available to economically extract some of them using standard REE recovery technology. Cell phones, for example do not yet lend themselves well to recycling. Most REE recycling schemes focus on specialized market segments. Solvay (Belgium) is one company developing technology for recycling the REE-containing luminescent powders in fluorescent lamps. Umicore, also in Belgium, is exploring the recycling of REE from nickel-metal-hydride batteries. Since 20-30% of the rare-earth elements are lost as scrap in magnet manufacturing, scrap recycling makes sense for this technology segment. Hitachi now recycles 90% of its magnet scrap and has dismantled air conditioners and hard disk drives to pyrometallurgically recover the neodymium and dysprosium. Santoku Corp. (Japan) also recycles the larger permanent magnets to mine the REE content within. A quantum shift is occurring in REE-intensive CRT screen technology for televisions and computers. Quantum dots are finding their way into the REE replacement stream for these systems and could represent the disruptive technology that may further erode the market for REE-containing HD screen technology. Samsung and LG (USA) won accolades for their quantum-dot-based TV screens at the 2015 Consumer Electronics Show in January. Quantum Materials, an innovator in this space, has taken the REE-replacing quantum dots and made them ‘greener’ by replacing the cadmium oxide cores with non-heavy-metal quantum dots. Designing electronics or components for easy disassembly represents an alternative way to capture and recycle critical elements. Present disposal technologies for these products are pretty basic. The electronic devices or components are shredded. Unfortunately though, this further dilutes the REE within the shredded mass, making it more difficult to extract economically. Electronics manufacturers, particularly smart phone makers like Nokia and Apple, are beginning to look at redesigns of their products for disassembly to make it easier to replace critical components as well as extract the valuable elements such as the rare earths in a more concentrated and more cost effective manner. The iPhone 6 is designed for easy replacement of the screen, touch sensor, and battery. It is the screen that contains small quantities of REEs, so designing it for disassembly should open up more cost-effective ways to concentrate and recapture valuable REEs. A recent report by Statista.com projects a surplus of cerium, lanthanum, and samarium (15,000-16,000 metric tons of oxide) by 2016 and a deficit (3000 metrics tons of oxide) in yttrium. Such surpluses may be advantageous for price considerations in polishing compounds and optical systems. However, the laser and optical-fiber segment of the industry may see shortages or substantially higher prices for the key REE, yttrium. The action of the Chinese Ministry in 2010 was a clarion call for producers and users of the rare-earth elements. What started as a near monopoly has now become a multi-participant game with new tools for mining, refining, and recycling. Users are now interested in controlling the amounts of REE they use, finding alternative options for the REE, and redesigning for easier material control. No doubt REE will remain highly valued and necessary in our high-tech world, but innovators now have some new metrics they can target. Rare-earth elements include scandium, yttrium, and the 15 lanthanides: lanthanum, cerium, praseodymium, neodymium, promethium, samarium, europium, gadolinium, terbium, dysprosium, holmium, erbium, thulium, ytterbium, and lutetium. The optics and photonics industry depends on rare-earth elements for optical fibers, high-definition TVs, LCDs, batteries, lens-polishing compounds, and other products. The rarest of these elements, thulium and lutetium, are nearly 200 times more abundant on Earth than gold. What makes them rare is that they are rarely found in concentrations high enough for economical extraction using traditional mining technologies. 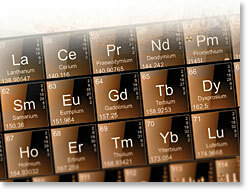 The most abundant rare-earth elements are cerium, yttrium, lanthanum, and neodymium. Their abundance is similar to the abundance of chromium, nickel, zinc, molybdenum, tin, tungsten, and lead. –Rosemarie Szostak is a senior analyst with Nerac Inc. where she advises clients in the areas of innovation, materials, specialty chemicals, renewable energy, sustainability, and intellectual property matters. She has a PhD in chemistry from University of California, Los Angeles. Media Partner, International Year of Light and Light-based Technologies.